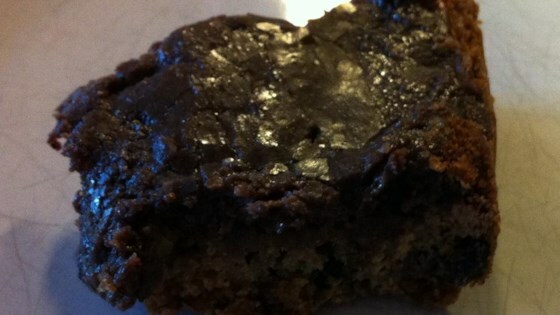 "This brownie cookie bar recipe is modified from one of my favorite cookie recipes that my friend and I made while experimenting in the kitchen. Disappears from the fridge!" Preheat the oven to 350 degrees F (175 degrees C). Line a 9x13-inch baking pan with parchment paper. Beat 1 1/2 cups white sugar, butter, and brown sugar together in a bowl until fluffy; add eggs and 1 teaspoon vanilla extract. Sift flour, baking powder, baking soda, and salt together into a separate bowl. Add to egg mixture. Stir in 1 1/3 cups chocolate chips. Spread batter evenly into the prepared pan. Bake in the preheated oven until edges are browned and crisp, 10 to 12 minutes. Cool cookies for at least 10 minutes. Pour heavy cream, 1/2 cup sugar, 1 teaspoon vanilla extract, and 1/2 cup chocolate chips, in that order, in a saucepan over medium heat. Cook and stir until melted, 3 to 5 minutes. Pour over cookies in pan. Watch how to make these sweet gluten-free dessert bars.